Comment: Good copy . Used books may not include companion materials, some shelf wear, may contain highlighting/notes, may not include cdrom , dust jacket or access codes. Could be an ex-library copy .Buy with confidence. Ships Fast! Satisfaction Guaranteed! Book by Paddy McCarthy about his exploits in Formula 1. 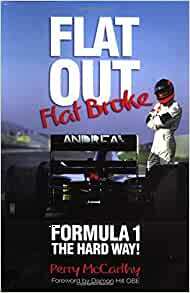 The Andrea Moda F1 team is a shambles in this humorous look at being flat out; flat broke!